Messier 105 (also known as NGC 3379) is an elliptical galaxy of some 55,000 light-years across, located about 34 million light-years away from Earth in the constellation of Leo (the Lion), while it is receding from us at approximately 911 kilometers per second. Its mass is estimated to be around 100 billion solar masses. M105 is the bright galaxy at the bottom. Above it is NGC3384 and the blue galaxy to the left is NGC3389. 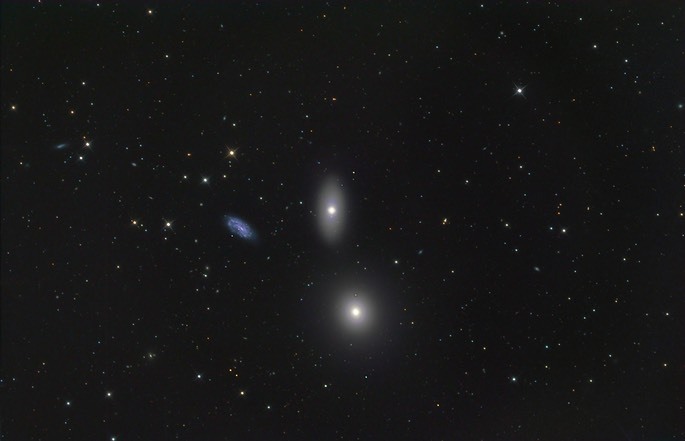 The three galaxies are part of what is called the M96 group in the constellation of Leo. This is a 10 hour exposure taken over several nights ending on April 8, 2014. Click on the image for more detail.